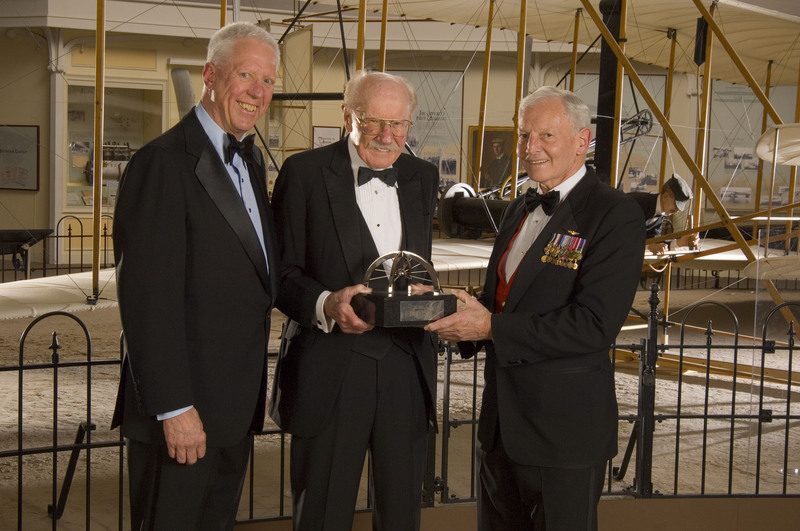 The National Air and Space Museum Trophy, the museum's highest honor, has been awarded this year to legendary aviator Robert A. "Bob" Hoover and NASA's space shuttle manager N. Wayne Hale Jr. and the team responsible for a crucial mission that restored confidence in the program. Hoover is honored in the category of Lifetime Achievement and Hale and the STS-121 team are honored in the category of Current Achievement. The awards were presented at a private ceremony at the Air and Space Museum building in Washington on March 7. Established in 1985, the award recognizes outstanding achievement in scientific or technological endeavors relating to air and space technology and exploration. As in past years, trophy winners received a miniature version of "The Web of Space," a sculpture by artist John Safer. For more information on the National Air and Space Museum Trophy and other awards in the museum's collections, visit airandspace.si.edu/research/aero/trophy/. The National Air and Space Museum building on the National Mall in Washington, D.C., is located at Sixth Street and Independence Avenue S.W. The museum's Steven F. Udvar-Hazy Center is located in Chantilly, Va., near Washington Dulles International Airport. Both facilities are open daily from 10 a.m. until 5:30 p.m. (Closed Dec. 25) Admission is free but there is a $12 fee for daily parking at the Udvar-Hazy Center. Inexpensive shuttle bus service operated by the Virginia Regional Transportation Association connects the center with Washington Dulles International Airport and Dulles Town Center. The 2007 National Air and Space Museum Trophy event was made possible through the generous support of Lockheed Martin Corp.
Robert A. "Bob" Hoover is honored as a fighter, military and civilian test and air show pilot of legendary proportions. No less an expert than Jimmy Doolittle said "Bob is the greatest stick-and-rudder man that ever lived." Bob Hoover began flying at Nashville's Berry Field in 1937, where he taught himself aerobatics. He joined the Tennessee Air National Guard and became a U.S. Army Air Corps test pilot charged with flying aircraft to the edge of their performance capabilities. Hoover was shot down on his 58th mission in World War II and spent almost 16 months as a German POW before escaping in a Focke-Wulf FW-190. After the war, he was a front line test pilot for such aircraft as the F-84 and P-80. He served as back-up pilot on the Bell X-1. Later, for North American Aviation, Hoover flew the first flight of the XFJ-2 Fury. He also tested the F-86 Sabre, including during bombing missions in Korea, and the F-100. In the 1950s, Hoover moved into corporate positions and began flying a precision aerobatic routine with a North American P-51 Mustang, then the T-39/Sabreliner and the Aero Commander fleet, culminating in the Shrike Commander 500S, now in the Museum's collection. He set altitude and speed records and was routinely sent abroad to demonstrate aircraft. As a safety pilot in the Reno Air Races, his advice saved the lives of several pilots in emergency situations. He was captain of the 1966 U.S. Aerobatic Team and his skill as an aerobatic performer is unmatched. In his most famous maneuver, Hoover poured iced tea from a pitcher into a glass on his T-39 instrument panel while performing a perfect barrel roll. He didn't spill a drop. Hoover has flown more than 300 types of aircraft and performed at more than 2,500 civilian and military air shows. Hoover is the recipient of the Distinguished Flying Cross and the Smithsonian's Lindbergh Medal. He is an inductee of the National Aviation Hall of Fame and the International Aerobatic Hall of Fame. He is the only man to serve two terms as president of the Society of Experimental Test Pilots. For his extraordinary career as a military, test and air show pilot, and as an ambassador for aviation, Robert A. "Bob" Hoover richly deserves the National Air and Space Museum Trophy for Lifetime Achievement. N. Wayne Hale Jr. and the STS-121 Shuttle Mission Team are honored for executing a crucial mission that restored confidence in America's space shuttle and put the program back on track. Even in an enterprise where success arises from teamwork, some challenges demand exceptional leadership. Especially in times of crisis, an organization needs someone with the expertise and perspective to make necessary changes, reinforce core values and reinvigorate the community for renewed success. Hale became that leader for NASA. Wayne Hale was appointed to manage the space shuttle program in 2005, and his first priority was to ensure a successful STS-121 mission the next year. But the task actually was to revive the program and put human spaceflight back on track for completing assembly of the International Space Station. NASA was still trying to recover from the tragic loss of Columbia and its crew in 2003, which had raised doubts about the agency's technical and managerial competence. The successful return-to-flight mission in mid-2005 had not fully allayed concerns about the safety of the shuttle system, most notably the potentially lethal shedding of foam insulation from the external tank during launch. As the STS-121 Mission Team tackled the technical tasks, Wayne Hale managed to inspire a dispirited workforce. In conversational email messages to the 16,000 people working in the shuttle program, he reflected on risk, personal responsibility, and the core values of engineering and exploration. He affirmed that spaceflight is a difficult and dangerous enterprise but also a noble one, worthy of their best efforts. These missives from the heart of leadership were circulated throughout NASA and widely shared via the media and Internet. The team leader and thousands of engineers, technicians, analysts, flight directors, astronauts and others--the equivalent population of a good-size town--rose to the challenge. The STS-121 Mission Team succeeded brilliantly, making changes in design, processing and systems that reduced the foam problem to negligible. The STS-121 mission was acclaimed for restoring confidence in NASA and the shuttle program, and the team continues working on the next STS mission, and the next, and the next. In one of his messages, Hale compared the work of space exploration to the Olympic torch relay. "We--here and now--are called to run our lap with skill, dedication, vigilance, hard work and pride." For doing just that, with success when it was most necessary, the National Air and Space Museum Trophy for Current Achievement is awarded to N. Wayne Hale Jr. and the STS-121 Mission Team.